Amateur roboticists (and gunmakers) Aaron and Eric Rasmussen built an autonomous sentry gun as a summer project. 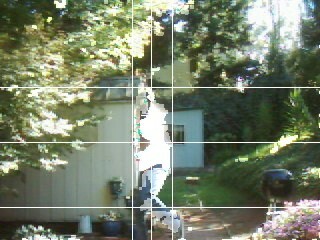 Aaron wrote custom software to acquire and track human targets using images recieved from an attached USB webcam. The brothers have incorporated as USMechatronics to begin building sentry guns based on the technology. 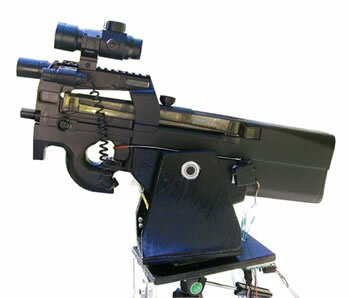 The device was built with hobby servos and a Mini SSCII servo controller; the gun is an Airsoft replica of an FN P90 that shoots .2 gram 6mm BB's. I was sure it would be easy to find early references to this kind of device in science fiction, but I'm stumped. In their webpage, the sentry gun creators credited movies like Congo (from the 1980 Michael Crichton novel) and various video games. In Crichton's novel, the sentry guns used to protect the camp perimeter against fierce gorillas appear to be laser guided by humans who pick out the targets. He noticed that the guns had an unfamiliar shape - they were somehow too slender, too insubstantial - and that the black cables ran from the guns to squat, snub-nosed mechanisms mounted on short tripods at intervals around the camp. "That's a LATRAP. For laser-tracking projectile," she whispered. "The LATRAP system consists of multiple LGSDs attached to sequential RFSDs." She told him that the sentries held guns which were actually laser-guided sight devices, linked to rapid firing sensor devices on tripods. "They lock onto the target," she said, "and do the actual shooting once the target is identified." Update 10-Oct-2006: Be sure to take a look at the recent South Korean robotic sentry gun to be put into use next year. Read more at The Sentry Gun; thanks to wererogue for the tip on this story.